A tour through the lovely east coast countryside taking in beautiful beaches and places of local interest. hippy markets. 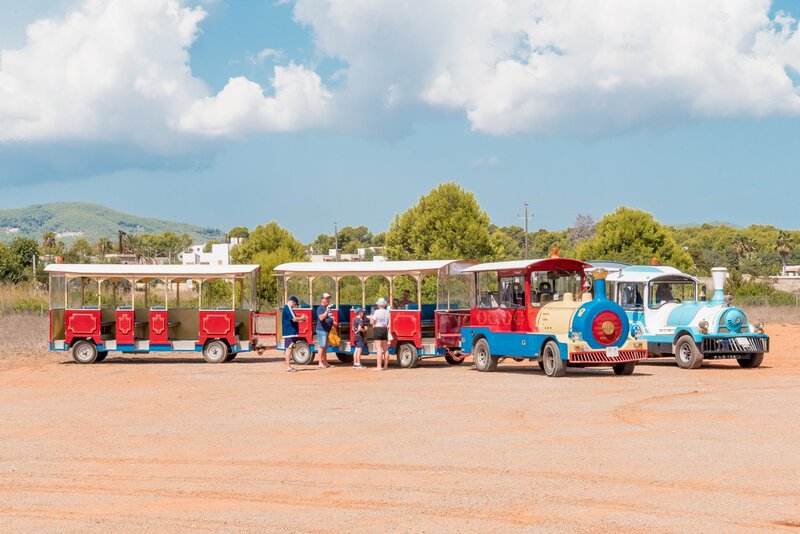 Four trips are available - all three hours long, taking you on these special trips from top family resort, Santa Eulalia. NOTE: There are also charming train tours available departing from Cala LLonga, Es Figueral, Es Caná, Portinatx and San Miguel. Ibiza's famous pirate towers and the lovely Cala Mastella coastline. If you want to see some pretty Ibiza countryside, this trip is for you. There's a stop at the quaint village of San Carlos, where you can admire its pretty whitewashed church and stroll around. It's then on to see an old 18th Century farmhouse, which gives a glimpse of life for the islanders of the past, with old artifacts and utensils; there's even a tasting of Ibizan liqueurs. The day ends on a small and tranquil beach where you can enjoy drinks and a spot of sunbathing. Price includes entrance to the museum and a free shot of Hierbas. leather ware, jewellery, clothing and ceramics as well as stop for a drink. to browse the many stands, buy some home-made liqueurs, try on some silver jewellery and find those presents for your beloved ones back home. Recommendations: We advise you bring water, sun cream and a swimming costume. Cancellation policy: If you cancel 48 hours before the departure date as indicated on your voucher, you will be fully refunded. This was a highlight of our trip. The train ride, although bumpy on occasion, was a really lovely chance to see a bit more of the island from a different perspective. thoroughly enjoyed it. A great way to see some of the lesser known parts of the island and to hear some of the history. Great for all ages and you get to see some stunning beaches and views. We also particularly enjoyed the opportunity to pause for thought at the church. The only drawback is that it felt a little rushed and I would have liked more time to take in the surroundings but this just convinced us to come back and hire a car and do it ourselves next time!